You’ve seen those classic detective films, the ones with the snappy dialogue recited by men in sharp trench coats. 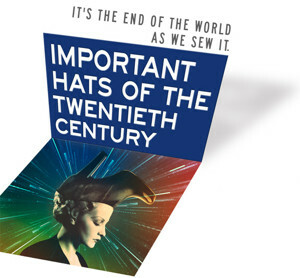 Nick Jones’s Important Hats of the Twentieth Century is detective flick pastiche, complete with radio addresses and some mad-cap antics thrown in for good measure. We begin in the early twentieth century, just after the Great Depression. Fashion reporter T.B. Doyle (John Behlmann (Significant Other)) is investigating a theft (he’s been asked to cover more hard news). We don’t yet know what’s been stolen, but we know a scientist was the victim. Next we meet Doyle’s secret paramour, fashion designer Sam Greevy (a delightful Carson Elrod (Peter and the Starcatcher)). He believes clothes should make women feel beautiful, and takes pride is being Savile Row-ready. His nemesis, Paul Roms (a deliciously zany Matthew Saldivar (Honeymoon in Vegas)), was not a model student in design school, but is now working on a new fashion item: a sweatshirt. Greevy, of course, is appalled. Important Hats, directed by Moritz von Stuelpnagel (Hand to God) is a funny and entertaining play, which sometimes is all you want. You could argue that it delves a bit into fashion’s place in society, and while the differences between Greevy and Roms do bring about some such discussions, this is not a message play. It’s meant to make you laugh and forget your cares for a couple of hours. That it succeeds is a feather in its cap, an important hat, don’t you think?